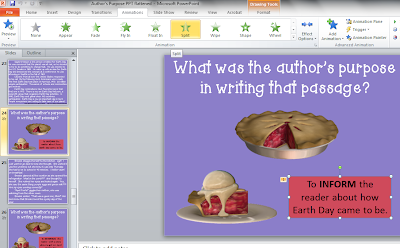 I am linking up with Teaching Trio and Teacher's Desk 6 today to repost what I have learned about "flattening" a PowerPoint so that images can't be "lifted" and fonts can be changed! I first posted this one back in March at All Things Upper Elementary. Ever since I learned to make PowerPoint presentations, I have enjoyed making interactive ones to present to my students. 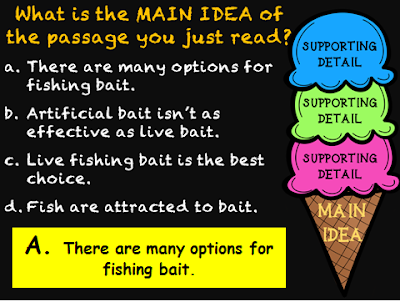 I almost always use a PowerPoint to introduce a new ELA concept. I tend to follow an established pattern of introducing the concept with the first few slides, and then have several practice opportunities for the remaining slides. Back to my story… I asked the tech teacher at my school, but she admitted that although she knew there was a solution to my question, she hadn’t figured it out yet. My online searches left me empty-handed… until one day when I must have typed in the magic phrase! I had my answer! Keep reading to see how I got from the BEFORE to the AFTER! Delete all of the animated text boxes. Go to the “Save as Type” box (the bottom drop-down box) and select “PNG Portable Network Graphics Format”. A box will appear on your screen. Click on “Every Slide”. 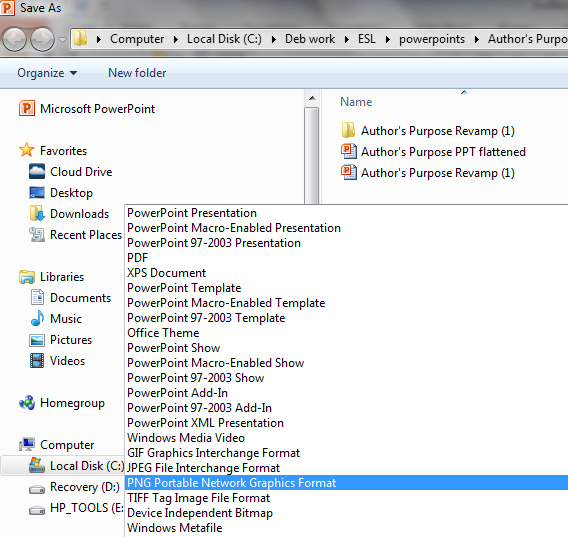 Once all the slides have been saved as PNG images, return to the folder where you have the PowerPoint saved. Click on the new folder that has just been created. The newly created PNG image of each slide appears here! Select Slide1. Copy (Ctrl C). 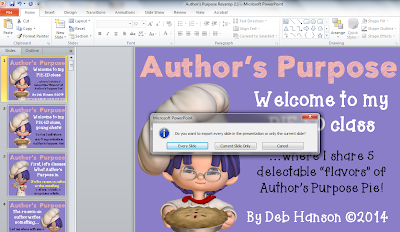 Open a brand new PowerPoint file. Paste Slide1 PNG (Ctrl V). Insert a new slide. Return to your PNG images and copy Slide2. 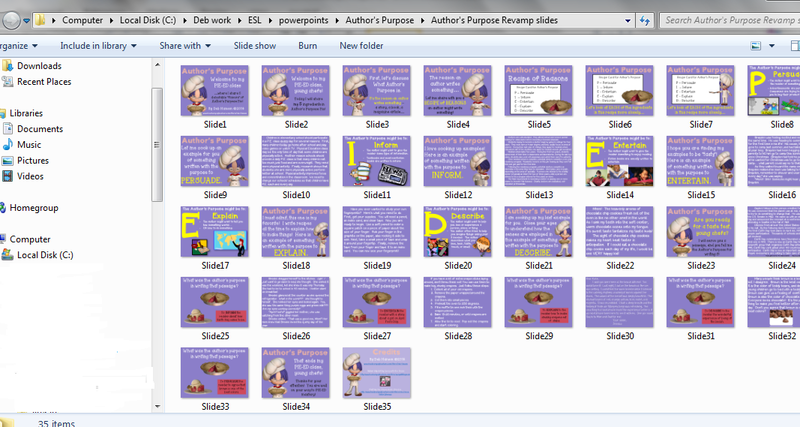 Continue copying and pasting slides until all of the flattened PNG slides have been pasted into the new PowerPoint. You're almost done - a FINAL step awaits you! 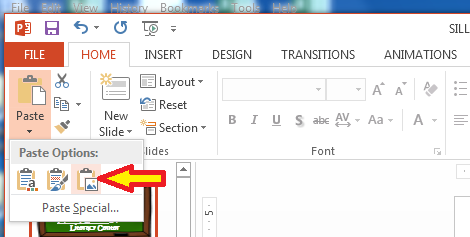 You now just need to add back the animated text boxes from your original PowerPoint file (those you deleted at the beginning of the previous step). Return to your original PowerPoint. Find the first slide with an animated component. Select that animated component, and copy it (Ctrl C). Add back the animation elements, as you normally would. Once you have completed the process of adding back any animated text boxes, you should be done! 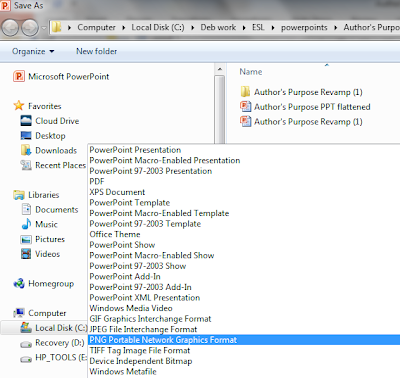 You now have a flattened PowerPoint presentation! This method has totally changed how I have designed my newest PowerPoints! Furthermore, the use of this flattening method has allowed me to greatly enhance the appearance my PowerPoints. 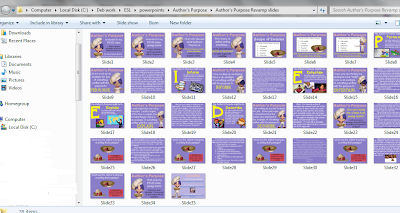 Armed with my new revelation, I have begun going about revamping all my existing PowerPoint resources – and I’m actually having a lot of fun with it! Wait… let me rephrase that. While I can’t say that the work involved is “fun”, it is highly gratifying to see my NEW finished products!!) Here are a few more “before” and “after” shots! 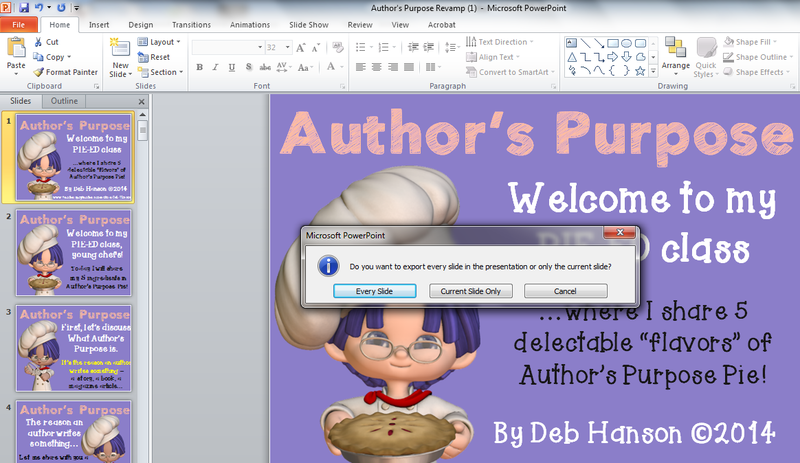 If you enjoy making PowerPoint presentations, give this method a try! Good luck! UPDATE!! My blogging friend, Lisa from Grade 4 Buzz, was kind enough to notify me that she tried my process on her Mac, and it worked! She did note, however, that she needed to take an additional step to improve the resolution of her slides once they were flattened. She said that under Options, she simply had to change the width to 2999. Thanks, Lisa!! Come back tomorrow for a sale announcement and a giveaway! Well done Deb! I hoped I was doing things correctly and you confirmed it! Love the after pictures! Your after pictures are AWESOME! I just learned how to flatten them this spring, too! It makes my school powerpoints so much cuter! Oh my goodness! So that's how you do it! I was halfway there, but was missing the animation concept! I missed this when you posted it initially. THANKS! 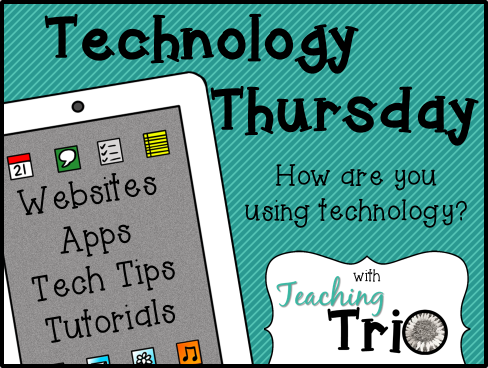 Thanks also for linking up for TBT! I value your support, dear bloggy friend! You're welcome! This process looks overwhelming at first, but once you get the hang of it, it's not too bad. The extra time involved is worth the finished product! Your PPT's really are impressive! It is apparent how much time and effort you put into them!!! I didn't know you could add back animation using this method. Thank you! This is awesome, Deb! What's the difference in saving your slide as a PNG versus a JPEG? Sometimes my stuff is blurry. Thanks to Lisa for her advice on Macs. I'll need to be checking that out. Hey Alison! I have to admit, I have no idea what the difference is between saving as a JPEG vs. PNG. I'm sorry! I love these kinds of tutorials. I'm a Mac user, but I still appreciate how it is done--us teachers are so visual. So now that you've figured out how to do it what the average time that it takes? I did this for my presentation last week! I created it on my Mac with all my fonts and knew that my fonts wouldn't be the same on the PC I had to use. So I saved all my slides as a jpeg and put it back in a power point. It does take time but it is so worth it!! All your power points look fantastic!